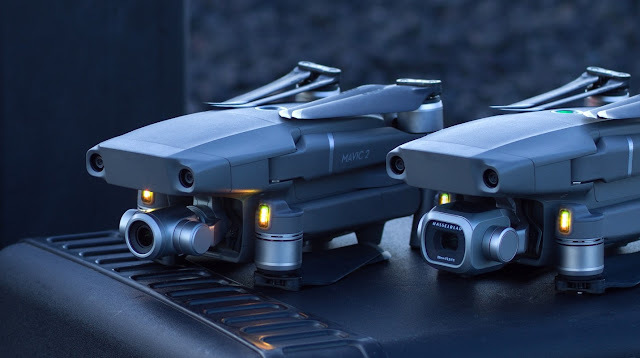 DJI recently introduced a new era for camera drones with two additions to its iconic Mavic series: Mavic 2 Pro, the world’s first drone with an integrated Hasselblad camera, and Mavic 2 Zoom, the world’s first foldable consumer drone with optical zoom capability. As stated in their small media event, The Mavic 2 is the most advanced DJI camera drone ever built, designed for professionals, aerial photographers and content creators. Incorporating the iconic folding design of the world’s most popular Mavic Pro, the Mavic 2 is a powerful platform with new gimbal-stabilized cameras and advanced intelligent features like Hyperlapse and ActiveTrack for easier and more dynamic storytelling. With an impressive flight time of up to 31 minutes and a more stable video transmission system, Mavic 2 delivers the optimal flight experience for capturing epic shots. • Free - pilots the drone manually while shooting a Hyperlapse video. • Circle - automatically flies the drone in a circular pattern around a subject you select to create a timelapse video that captures the action. • Course Lock - keeps the camera fixed on shooting subject while the drone flies in a straight direction to create a unique perspective. • Waypoint - plans a complex flight path based on both altitude and GPS coordinates to capture complex shots. The Mavic 2 delivers autonomous flight capabilities that help you capture shots with even more confidence in complex environments. A fully upgraded FlightAutonomy system transmits data to a more powerful central processor for more accurate obstacle sensing and safer flight. For the first time ever in a DJI drone, Mavic 2 has 10 sensors on all sides of the aircraft to automatically detect obstacles in its path and help prevent collisions , allowing you to focus on capturing the perfect shot. A newly designed OcuSync 2.0 video transmission system enables a more stable connection between the drone and its remote controller. The system features stronger interference resistance and auto-switching capabilities that supports both 2.4 GHz and 5.8 GHz frequency bands with the capability to use different frequencies for uplink and downlink data streams. It delivers 1080p video transmission feeds at a distance of up to 8km , allowing you to instantly edit and upload Full HD footage directly from the video cache in the DJI app in a wider variety of situations. Original resolution photos in JPEG can be saved directly to your mobile device, so you can immediately share what you create without the need to transfer files from the drone.